I have been stressing a fussing over the house so much lately. This weekend I just relaxed and enjoyed the weather. It was great. Enjoy the pictures. Nic sitting by the creek. My favorite spot to swim in the summer. Okay, so I have never blogged about food before. And I don’t know why. Food is a huge part of my life. I cook ALOT. I love finding new recipes and ingredients. Nic and I have been eating so much healthier lately also. Mainly because I started being a vegetarian a couple of months ago. I never really ate too much meat before, so it was an easy transition. Quinoa is extremely good for you and is a good substitution for rice. My doctor recommended it to me a while ago to help with my headaches. Yes, headaches. It has a ton of magnesium in it and supposedly that helps with migraines. It also has a lot of protein. 2 days ago, I made a great quinoa side dish. I found a recipe online for quinoa and chickpeas, and I just tweeked it a little. Here’s how it turned out! 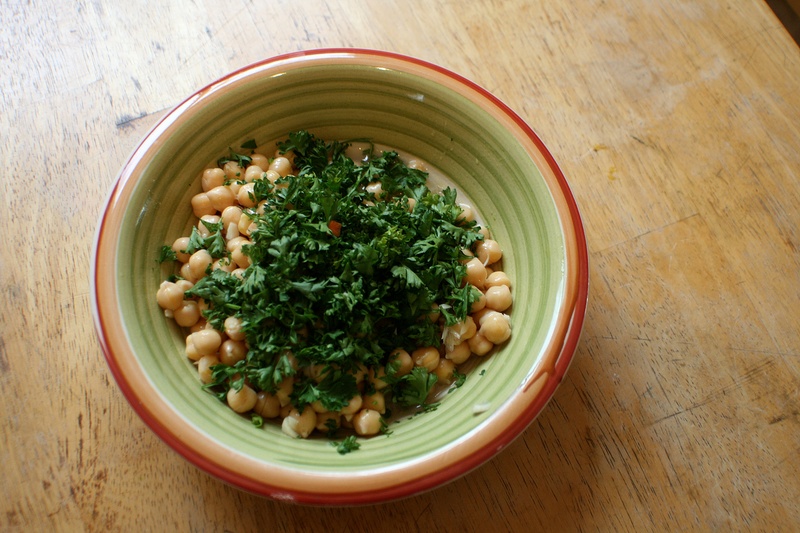 First, I put the drained chickpeas in a bowl with the lemon juice and garlic. I let this sit for about half an hour in the fridge and then top it off with parsley. Bathing the chickpeas in lemon juice and garlic. With fresh parsley on top. 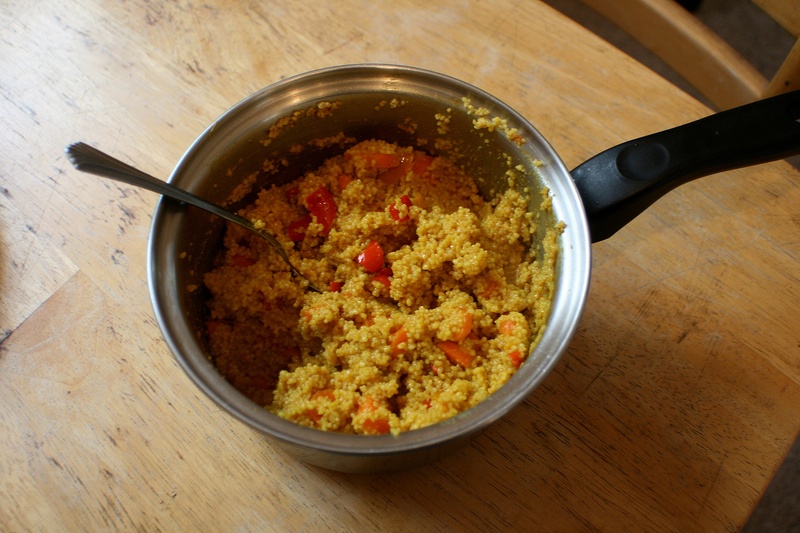 Then, I sauteed the spices, carrots and peppers in the bottom of a pot with the olive oil. After the peppers were soft (after about 5-8 minutes), I added 2 cups of water and the 1 cup of quinoa. I put the heat on med-low and simmered for 15 minutes, stirring a lot. Then I let this cool off. 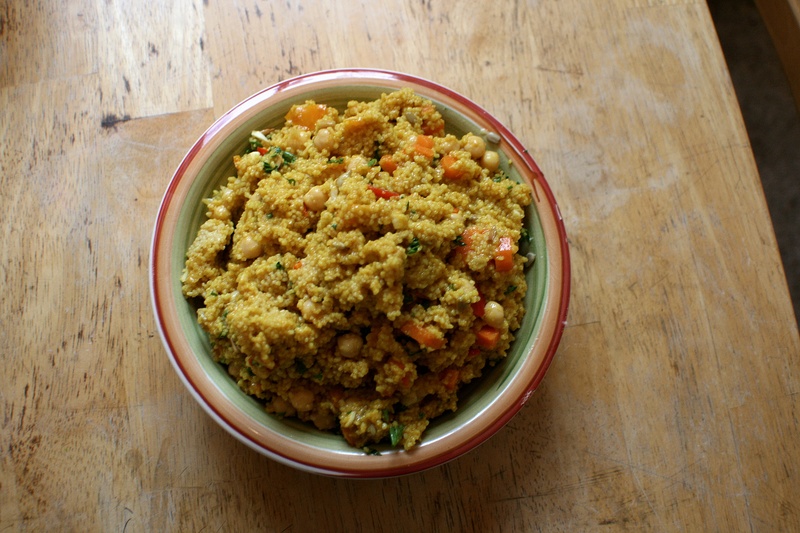 After everything cooled down, I added the chickpea mixture to the quinoa mixture. I also stirred in the sunflower seeds for some crunch. I served it kind of warm, but the next day I brought it to lunch cold and it was great. It has been very nasty outside the past week. Half of the U.P. didn’t have power on Tuesday and Wednesday because of the storms. So this weekend I stayed inside and redid the kitchen. I wasn’t sure what to really expect. We originally wanted to do white cabinets with a dark countertop. But we found a gallon of $5 paint at Lowe’s and we decided to use it on the cabinets instead. The color looked gray in the paint can, but now that it is on the cabinets, it looks kind of blue. We still plan on doing the countertops when we have the money. What color should we paint the walls? We painted the ceiling of the guest bedroom bright purple. What do u think? Also, You can buy raffle tickets to win the kayak package below from CKS, Liquidlogic Kayaks, Stohlquist Waterware, Werner Paddles, Snap Dragon Skirts, and WRSI Helmets. Tickets are only $10 and all of the proceeds help Ross and Brianne’s First Descent. Click here to buy a ticket. Come on, for ten bucks, you can win an awesome kayak package. Can’t beat that. First beautiful weekend in a while…. My parents came up this weekend to see the new house. We cleaned up the yard a little bit and bought some paint, shelves and other things for the house. We also we able to get outside because the weather is wonderful. Mid 50’s with lots of sunshine. Went for a couple hikes with them and my friend Christina. I was talking to someone about “The Last King of Scotland” movie recently. Which is about the Ugandan dictator Idi Amin. Then I remembered the rumor about the leader dying from a severe case of Syphilis (which is what supposedly made him crazy and irrational while in office). I Wikipedia-ed the rumor and found that he died of kidney failure. This makes the rumor somewhat true because kidney failure is sometimes caused by untreated Syphilis.